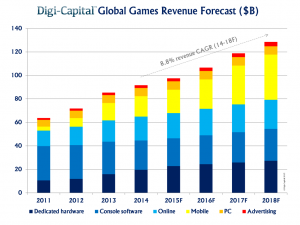 Our Friends at Digi-Capital have released their latest analysis of market trends, this time regarding the games industry. The Headline information is that 2014 saw a record $24B of game company exits across acquisitions and IPO’s, with more than half of this value being driven by mobile. $15B of the $24B was from acquisitions, with 5 ‘megadeals’ being responsible for $8.1B of this. The other $9B came from IPO’s, which was dominated by Asia. These statistics could be seen as representative of a bubble, but the analysis from Digi-Capital explains why these statistics have a more subtle meaning. 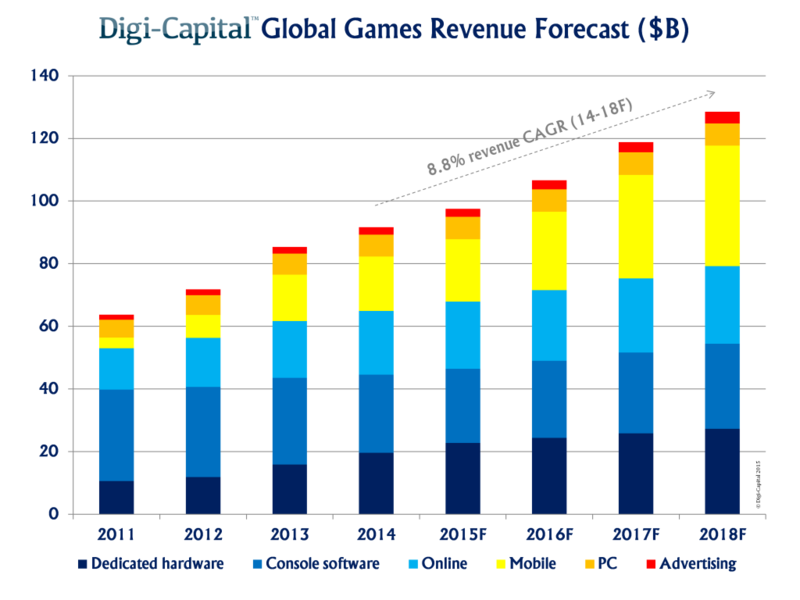 Digi-Capital hark back to an earlier report they prepared at the beginning of 2014, where they predicted that the games software market would reach $100B by the end of 2017. Having re-analysed the data from last year, they have revised this to happen at the end of 2018 instead. This is due to the fact that only mobile gaming is showing strong double digit growth, with the possibility that virtual reality could also become a breakout. This leaves their overall growth forecast for games software/hardware at 8.8%. While this is of course a healthy number, Digi-Capital point out that markets with single digit growth cannot be described as bubbles, as in these conditions “a rising tide no longer lifts all boats”. In this instance, not just any company can be guaranteed to grow exponentially on the crest of a wave, and the quality of the product and company is far more important. Hit hardest by this single digit growth are the mid-tier games companies, according to the report. Big corporate firms with hit IP’s (Intellectual properties), user scale and cash flow are able to invest in infrastructure and marketing to compete in a stable growth market. Smaller independent firms may not have a hit IP yet, or the advantages that come from being a big firm, but their costs are far lower, allowing them too to compete. It’s the mid-tier firms that Digi-Capital warn could be in for a tough time. They may not have the hit IP’s yet, or the advantages from being a large-scale company, but they still have the costs associated with infrastructure and marketing. It isn’t the end for them by any means, as they of course still have the capability to produce a hit IP, but they seem to be in the most vulnerable position over the next few years. A further challenge for mid-tier companies detailed in the report is the nature of acquisitions and investments in a stable growth market. The big corporate buyers are already managing their own cost bases, and so acquiring whole teams is low on their list of priorities. It is exceedingly difficult to overtake big companies when you are medium sized, and the investment amount of $1.5b in 2014, while not insignificant, is still 25% lower than it was in 2011. This all adds up to difficult years up ahead for non-savvy mid-tier games companies. This analysis, while not overly pessimistic, means that companies have to be smarter to see success. KamaGames, who we have worked with, have a portfolio that currently reaches 70M users worldwide. They have now partnered with Manchester United, and will launch special edition s of their games with a Manchester United crest, imagery and theme. As they are one of the most supported teams worldwide, this opens up an opportunity to significantly grow their user base. Another way to keep up growth and attract attention is to focus on the highest growth area of the sector. Both KamaGames and another of our clients, Joybits, focus on the mobile side, as this is the only area with double digit growth. As detailed in a previous Forsyth Group blog, Games are the app segment with most frequent use after downloading, so there is scope for this area to continue to grow. The report ends with a warning that until there is a new wave of innovation that can accelerate market growth, consolidation is the key. This isn’t necessarily bad news though, as it means that quality is more prized than quick, unwarranted growth. Fulfilling those New Year’s resolutions – how are you doing? January is a Marmite month: on the one hand we love the fresh start, the inspiring resolutions, the chance to make this the most healthy, productive, educational year of our lives; whilst on the other hand, we’re struggling to resist those glasses of wine, and stubbornly refusing to wake up before the crack of dawn to crack on with our new exercise regimes. On January 1st we bounded out of bed with the determination of an ironman triathlete (after the hangover had subsided); now that it’s almost half way through January, the novelty of cruciferous vegetables has worn off, and the sharp reality of running on a dark wintry night is hitting us hard, we’re looking to re-energise our motivation by reviewing our goals. We’re determined to beat the January blues with both company-wide and individual life-hacks. We’ll keep you updated on our progress and we wish you the best of luck with your own. As part of this, we will be blogging about the different apps/tech/self-help programs we use to 1. Make sure we stick to those pesky resolutions and 2. Let you know which apps/events/self-help programmes we find most effective. We’d also love to hear what is helping you achieve your 2015 goals, so do reach out to let us know! As it is the New Year, and by now everyone has returned to work, we thought we would write a list of our New Year’s resolutions, and how we are going to use technology to help to implement them. I think we can all agree that January is not the best month. It’s cold, it’s dark, you’ve spent too much money on Christmas presents and parties, and summer seems a long way away. However, rather than letting it all get too much, we are going to use the Headspace app to clear our minds from stress, helping us to work harder and keep focussed, but also stay relaxed and beat those January blues. In our busy modern lives, it can be difficult to either find the time or the motivation to read enough books, when it is all too easy to be distracted by a screen, be it the television, computer, tablet or phone. Mark Zuckerberg seems to have noticed this trend (which he is partially to blame for! ), and has now started a book club on Facebook, which has already garnered over 180,000 likes, and the first book selected, “The End of Power”, has sold out on Amazon. In our ever-increasingly global world, being able to communicate in more than one language is a vital skill. Now, thanks to apps like Duolingo, you can learn a new language on your phone, meaning it can be done anywhere. From the commute to the bath, there is now no excuse not to try to broaden your linguistic skills! Here at the Forsyth Group some of us could safely be called caffeine addicts. This year, we’ve resolved to give up on instant coffee, and we have instead started ordering from Pact. With Pact’s algorithms, you can rate the coffee you receive and they will tailor future deliveries to your taste. The difference is unbelievable, with coffee now being a pleasure as well as a necessity! YOU-app is a new IOS app that aims to gently nudge its users into healthier daily habits by use of what they call “micro-actions”. Promoted heavily by Jamie Oliver, the idea behind the app is that to create sustainable change in one’s life, research has shown that small steps, rather than radical leaps, are far more effective. All of the above resolutions are achievable according to this small change principle, so let’s hope we can stick to them! Happy New Year from the Forsyth Group! We hope you had an excellent Christmas and are looking forward to an exciting year ahead. Hiring Big Data expertise continues to be a challenge for the start-up ecosystem, and the need to control and analyse data spans a wide range of tech sectors. However, with the London start-up scene buzzing, candidates are finally leaping from the banks and corporates into early stage ventures. For example, we have been working with the founders of Last.fm on their new venture, Lumi.do, to hire top-level data science and product candidates for their content curating platform. These candidates left giants such as Ebay and Microsoft Bing to join a more exciting, fast-paced, high growth culture, and to be a part of building the future of the web. London has become an innovation hub for fintech. Figures released at the end of November by London & Partners showed that London based fintech firms had raised $539M, which was triple the amount raised in 2013. We placed a number of high level executives in London for fintech start-ups in 2014, for companies head-quartered around Europe, including Iceland (www.meniga.com) and Denmark (www.inpay.com), who saw London as the clear choice to build out their teams. Social continues to be a hot sector. We recently helped social fashion e-commerce site, Styloko, hire a rockstar CEO and well-renowned NED, both of whom were excited to join a company at the forefront of shopping discovery. We have also been working with 23snaps, the leading social network for families, helping them build out their marketing and data science teams, and to hire an NED. As pointed out in a recent blog, Mobile Social Networking is the fastest-growing consumer mobile app category, and this looks set to continue in 2015. 2014 saw a rush of disruptive medtech and biotech start-ups. From personalised mobile healthcare advice (Your.MD, CEO), advanced micro-needles (Innoture, Commercial & Operations Director), to physiotherapy fitness equipment and data platforms (MuJo Mechanics, Commercial Director), we have already seen a lot of innovation in this space, and we predict a lot more investment this year. In 2014 we attended the KPMG Future of Healthcare event, which was designed to help early-stage health-tech companies better understand the UK healthcare industry, get some advice on how to break into the market, and raise angel investment. Corporates are beginning to see that they have a vested interest in engaging with start-ups, as it will help them keep up with the innovation smaller companies are bringing to the market. At the Forsyth Group, our relationship with the tech scene is a symbiotic one, as we are also active investors. As investors in Seedcamp, we were delighted to see Transferwise raising another $25 million and boasting a high profile with adverts scattered all over the UK. UberVU, where we placed the CEO and VP Marketing, also had a fantastic year, with their acquisition by Hootsuite. We recently invested in fund III of Seedcamp, and we are sure that this year will see continued success of their portfolio companies. Wishing you all the best for 2015 and we look forward to seeing you soon.